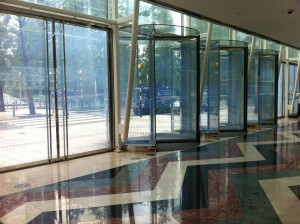 Security glass requires the highest level of design consideration to ensure it offers the highest level of protection. In response to market demand, Smartglass International has developed specially constructed switchable glass panels which can withstand high impact. The polycarbonate protective shield applied to the panels protects the product from penetration by sharp objects and prevents spalling – where small pieces of glass may break away from the face and become projectiles. In the UK, we are discussing the limits of switchable security glass in a prison for use in the holding cells and yard. Switchable Security Glass panels offer safety to inmates and staff whilst not restricting light and visibility throughout the units in the high security location. Prototypes are being commissioned for a train station in London to offer a similar solution, protection of staff and any visibility restrictions are our highest concerns. Smartglass International offers a full suite of security glazing solutions including shatter proof glass, impact resistant, bomb proof, bullet resistant and bandit proof glazing.